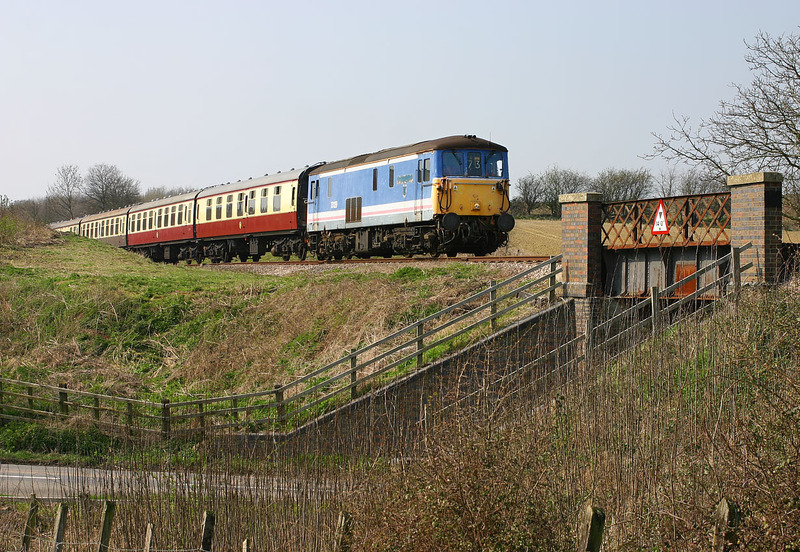 While waiting for the 37s on the 13:50 Toddington to Cheltenham Racecourse service near Far Stanley on 1 April 2007, during the Gloucestershire Warwickshire Railway's Diesel Gala, I casually took a picture of 73129 returning from Cheltenham Racecourse with the 13:30 service to Toddington. As it was backlit, I thought it would just be a record shot, but I am quite pleased with the picture, as the road and bridge add a scenic frame to the picture. The road is the minor road from Gretton to Gotherington. I'm just glad that there isn't a bright yellow car in the foreground!